Bacon Wrapped Chicken - Low Carb, Paleo, Gluten Free! Bacon Wrapped Chicken is a perfect low carb appetizer, or you can cut it up and serve it on a salad! 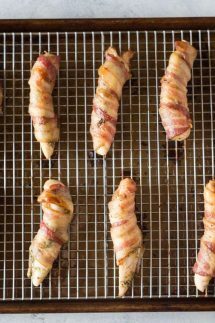 I wanted to add a little more flavor to this recipe, so my version of Bacon Wrapped Chicken has both dijon mustard and Italian herbs to add a little more interest. 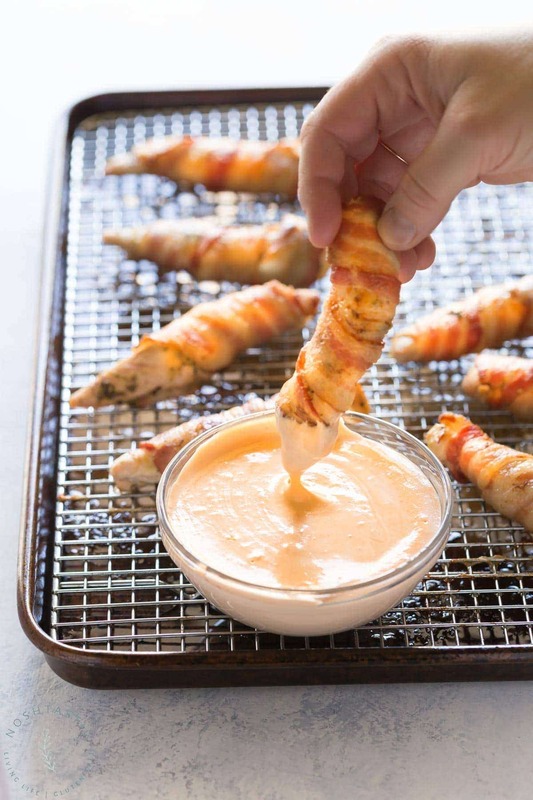 Start by brushing on a little Dijon mustard onto the chicken tenders. I used ready cut chicken tenders from the store for convenience. Then once you have done that sprinkle a little Italian Herbs seasoning mixture onto each of the chicken tenders, but don’t overdo it! 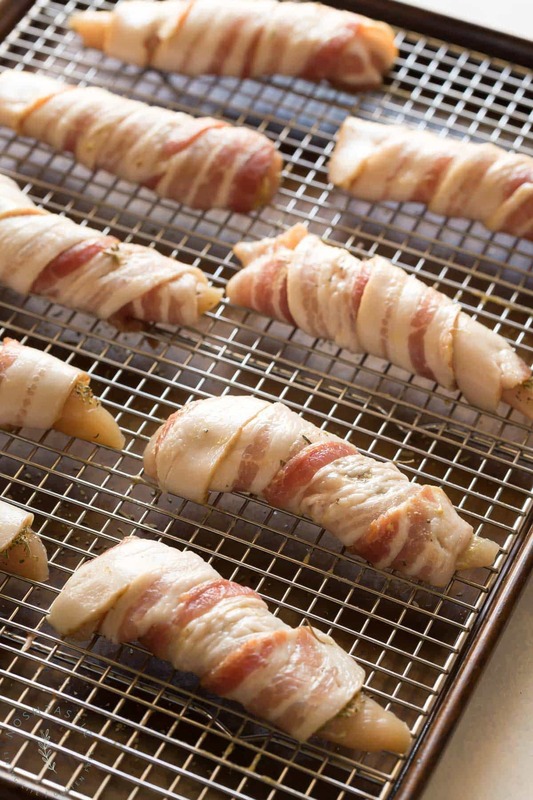 Then wrap the chicken tender pieces in one length of bacon each and place each chicken piece on a rack over a sheet pan. 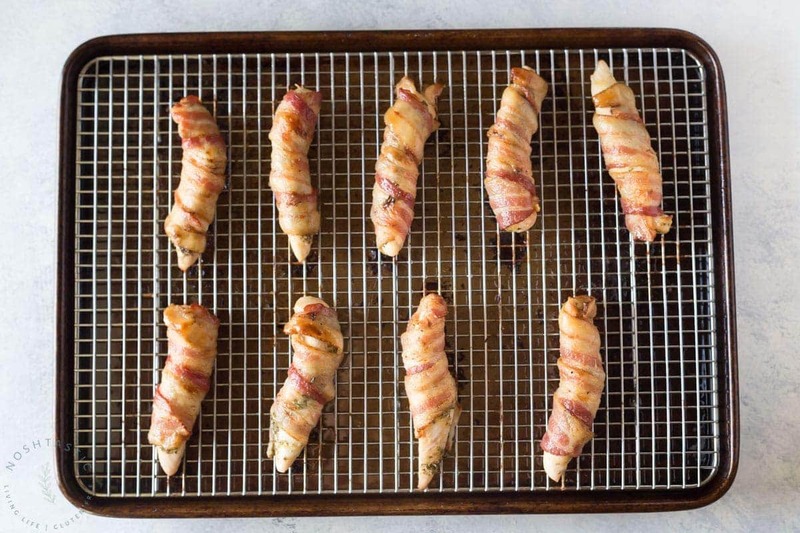 This will help ensure that the bacon stays crispy over the chicken, if you sit it directly on the sheet pan the bottom of the bacon wrapped chicken pieces may become soggy. Then bake in a 375F oven for about 20- 25 minutes until the chicken is cooked through. 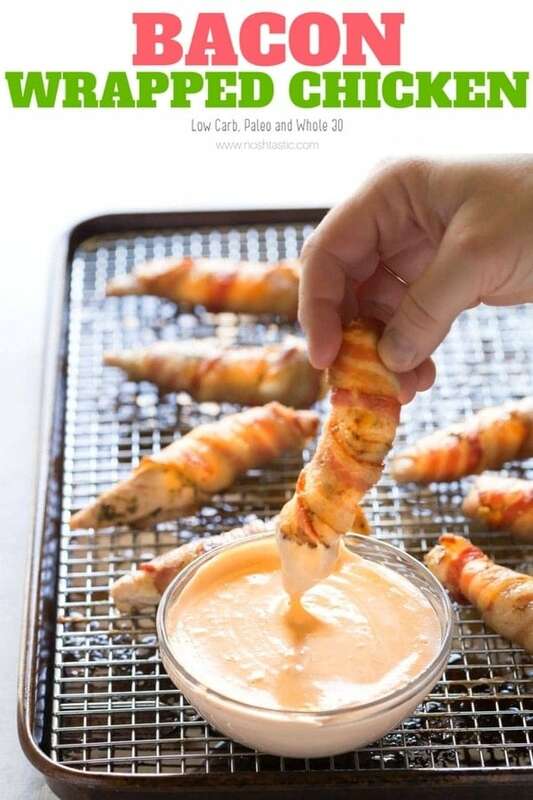 If you want the bacon a little crispier simply broil it for a few minutes more. I served mine with some of my Mississippi Comeback Sauce! It’s not low carb though so if that’s a concern for you then just skip it. Sheet Pan – I love my half sheet pans, I have three! Silicone basting brush – Such a versatile tool and super easy to clean! it worked great for spreading on the mustard. Easy low carb and Paleo Bacon Wrapped Chicken Tenders! 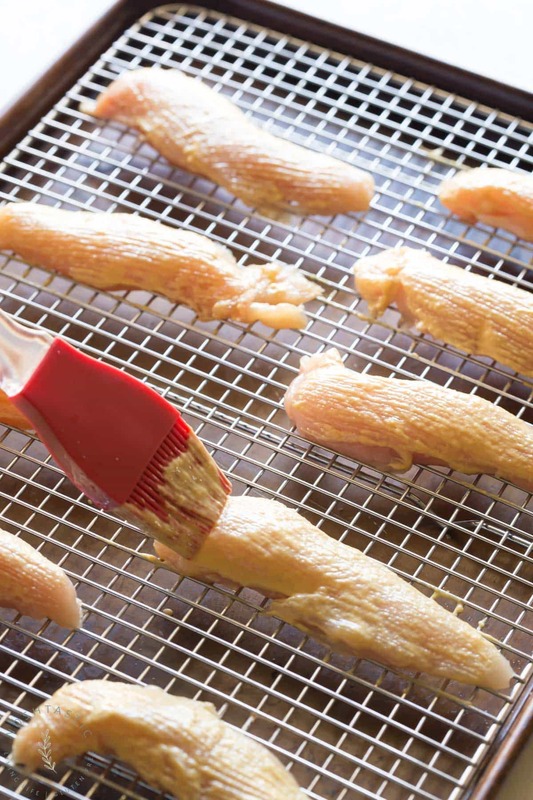 brush on a small amount of dijon mustard to the top of each chicken tender. Then sprinkle on a little Italian seasoning and wrap the chicken tender in bacon. 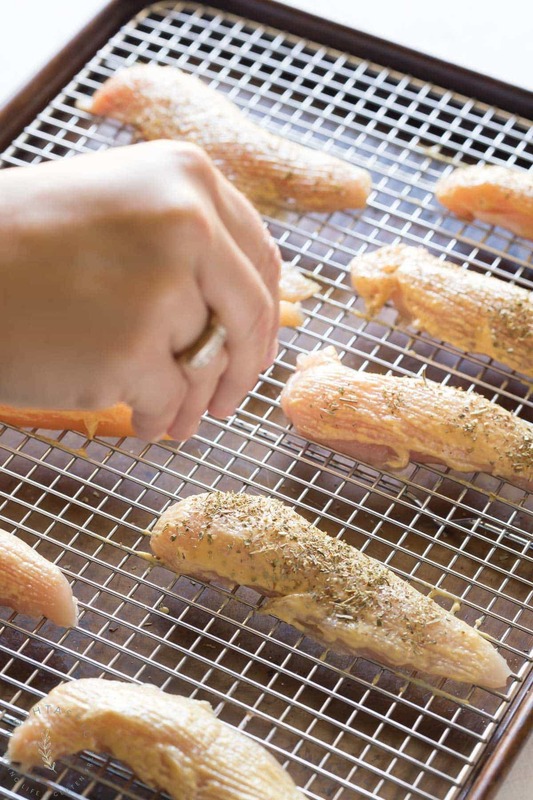 place all the chicken tenders on a rack over a sheet pan and bake for 20-25 minutes or until the chicken is cooked. If you need to crisp the bacon some more simply broil them for a few minutes. I served it with my Mississippi Comeback Sauce, it's not low carb or Paleo though.